Be the first to share your favorite memory, photo or story of Eudell. This memorial page is dedicated for family, friends and future generations to celebrate the life of their loved one. 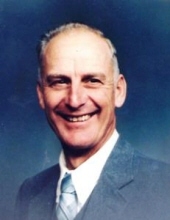 Mr. Eudell Montgomery of the Ebenezer Community in Green County, Kentucky, son of the late Lester Montgomery and Hallie Akin Montgomery, was born on January 12, 1937 in Green County and departed this life on August 3, 2018 at his residence. He was 81 years, six months, and 22 days of age. He had made a profession of faith in Christ and was a member of the Mt. Gilead Baptist Church where he had served as the Chairman of the Deacons for forty years. He was a farmer and a retired Taylor County RECC employee. Survived by his wife of 60 years, Peggy Wright Montgomery of the Ebenezer Community in Green County, having united in marriage on September 7, 1957. Other survivors include: one daughter: Lana Southwood of Campbellsville; one son and a daughter-in-law: Timothy and Tina Montgomery of Charlestown, Indiana; two sisters: Eunice Wright of Campbellsville and Linda Lawson of Lebanon Junction; two grandchildren: Jonathan Southwood of Campbellsville and Rebekah and Bob Algard of Norman, Oklahoma; two nephews: Gary Lawson and Charlie Lawson; two nieces: Connie Wright and Kay Lawson Ensor; four great nephews: William Wright, Mitchell Wright, Chaz Lawson and Tanner Ensor; three great nieces: Hope Lawson, April Lawson and Shelley Kay Ensor. Mr. Montgomery was also preceded in death by one brother: Dencil Montgomery; and a brother-in-law: Buster Lawson. The funeral services for Mr. Eudell Montgomery will be conducted at 11:00 A.M., CST, Wednesday, August 8, 2018 at the Cowherd and Parrott Funeral Home with burial to follow in the Liberty Separate Baptist Church Cemetery. Bro. Jason Sherrill and Bro. Steve James will be officiating. Visitation is requested from 3 P.M. until 8 P.M., Tuesday at the Cowherd and Parrott Funeral Home and after 7 A.M., Wednesday until time of the funeral service. Memorials are suggested to the Mt. Gilead Baptist Church Building Fund or the Liberty Separate Baptist Church Cemetery Fund, which can be made at the funeral home. To plant a tree in memory of Eudell Montgomery, please visit our Tribute Store. All times listed are central times. "Email Address" would like to share the life celebration of Eudell Montgomery. Click on the "link" to go to share a favorite memory or leave a condolence message for the family.